Summer. A bit earlier than Purple Coneflower. Mixed beds, naturalizing, native plantings. Attracts butterflies and birds. Very tough. Tap rooted so challenging to divide or move. 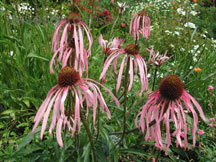 Exceptional for native plantings.